Utforsk strendene, bushlands og naturens underverk rundt Perth på denne helgedagskonserten. Spot ikoniske Aussie dyr som grå kenguru og koalaer når du reiser gjennom Yanchep National Park; ta utsikten over Lake Wagardu; og gå inn i den gamle Crystal Cave. Etter å ha tucked i en deilig lunsj på Chocolate Drops Tearoom (inkludert), avdekke universets hemmeligheter ved Gravity Discover Center, spasere langs Burns Beach og besøke Surf Hotspot i Scarborough Beach. Patricia our guide was marvellous, there was only two of us on the trip so we had plenty of time. We saw Kangaroos and Koalas at Yanchep and went on a lovely walk looking at the wildflowers. Lancelin and the pinnacles were very enjoyable as was Scarborough beach, although we just missed the sunset! A great day out with an excellent guide, Patricia. Went to the National park Yanchep saw Roos and very sleepy Koalas, visited the Crystal cave, guide here was also excellent. After lunch visited the Pinnacles Desert, and rounded off the day watching the sun go down on Scarborough beach. Only 3 of us in tour, so a good party size for this trip. A Happy Happening Day out. A small group with an expert like Patricia. What more can one need for a perfect trip. Well planned 12hrs capturing major attractions of Perth. Worth the money spent. Great tour. Getting to see two national parks on the one tour was excellent. Yanchep was amazing and we had some great sightings of wild Kangaroo and Koala bears. The pinnacles were superb and we had lots of time to take fab photos there. We ended up on Burns beach to see the sunset over the Indian Ocean. I'd highly recommend this tour. Patricia made this one of the best and most memorable days of my visit to Perth. 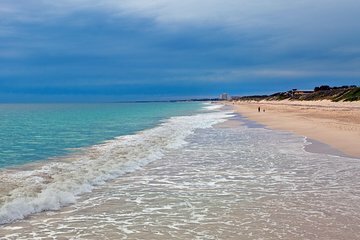 If you have very little time in Perth I strongly recommend this tour as it goes far out up north along the coast and the beauty of Perth is it's stunning natural surroundings just outside of the city. I call this the 'Rocky Road' tour because it was full of interesting rock formations. A highly tailored tour that began at Yanchep, where she included a walk trail around the lake the other tour operators weren't seemingly taking that and being an animal and nature lover, I also liked the fact that I could see the koalas and kangaroos in the wild rather than 'touch the koalas.' Patricia also knew a good deal about the names of birds and trees that were all so new to me in Australia and that was important for me. Then we went onto the interesting crystal cave with its dripping stalagmites and tites. After some great views of the Australian landscape and ghostly appearances of floating white dunes in the middle of green bush we arrived at the pinnacles. This moonscape is other worldly and you're going to be amazed at it once you're there. Patricia had also altered the tour a bit according to my taste as we went along, as I was the only one. When we had extra time, she took slight detour to the Lancelin Dunes. She does know how to pick a good restaurant for the best locally made delicacies. On our way back we stopped at Burns beach for an amazing sunset and yet some more interesting rocks along the beach. One of them looked like an elephant was coming right at me. These rocks like the ones at the Pinnacles, had also been partly eroded by air into fantastic shapes. We ended the tour at Scarborough beach and I was very happy with my day. I truly had a feel of Australia, as Perth was my first stop. A very varied insight into the region and ever changing landscapes. Thanks Patricia for this fantastic tour! A wonderful day out. The tour company took me even though I was the only booking that day and included many more stops along the way. Had a lovely walk through the wetlands in Yanchep and saw kangaroos and koalas. The cave tour was great and very interesting. In the afternoon we drove along the coast and stopped for walks along the beaches. The guide took very good care of me all day . Thank you, Patricia.